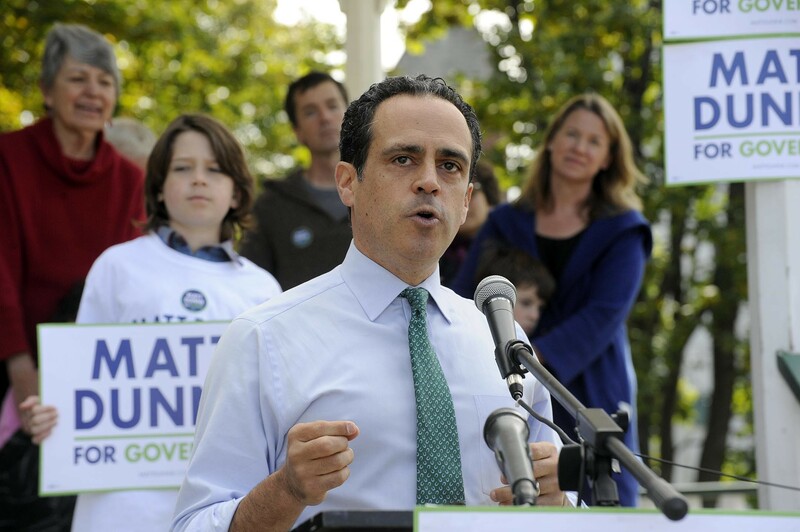 Matt Dunne kicks off his gubernatorial campaign Monday in Barre. Hartland Democrat Matt Dunne won a seat in the Vermont legislature nearly a decade before any of his competitors in the 2016 gubernatorial race. But as he formally kicked off his third statewide campaign Monday, the Google executive characterized himself as an outsider who would deliver the change he said Vermont requires. "We need to have new leadership — leadership that has the ability to move beyond the traditional structures of state government," Dunne told a small lunchtime crowd gathered in Barre's City Hall Park. Standing in front of his wife, the writer Sarah Stewart Taylor, and their three young children, Dunne said he was running for governor to preserve the "sense of community" that defined his upbringing in Hartland. Now 45 and sporting a touch of gray, the former wunderkind politician credited the experience of raising children with providing a new "sense of urgency" to his quest for public office. "I'm running for governor because we can't allow that sense of community to be lost in our state," he said. Since registering as a candidate in July and announcing his candidacy by email in September, Dunne has sought to distance himself from the Democrat he's hoping to replace: Gov. Peter Shumlin. That continued Monday, as the candidate explained how he'd build "an economy that works for all Vermonters and all Vermont." Such an economy, Dunne argued, requires "actually deliver[ing] high-speed internet to every corner of our state." It requires leadership, he said, "that fixes our broken health care system, that makes sure that websites work and that keeps us on the path to universal health care reform — because I think we can all agree that health care is a human right." Dunne appeared to be referring to Shumlin's inability to deliver on campaign promises of universal broadband and single-payer health care — as well as his struggle to get the Vermont Health Connect website up and running. Dunne also seemed to take a dig at his potential Republican rivals, Lt. Gov. Phil Scott and retired Wall Street banker Bruce Lisman, who have called for more limited government. "The next governor cannot be a caretaker governor and cannot be a governor that tells Vermonters, 'You are on your own,'" Dunne said. "This campaign needs to be about action and it needs to be about urgency." As is typical of those delivering campaign kickoff speeches, Dunne mostly steered clear of policy specifics, though his campaign released several proposals Monday on its website. Dunne did make one notable policy pronouncement in Barre: In order to "restore trust" in state government and combat a growing cynicism in Vermont, he said, it is "past time" to create a state ethics commission. Dunne was the second gubernatorial candidate to hold a campaign kickoff. House Speaker Shap Smith (D-Morristown) did so in August. The third Democrat in the race, former transportation secretary Sue Minter, is scheduled to do so Tuesday in Waterbury.